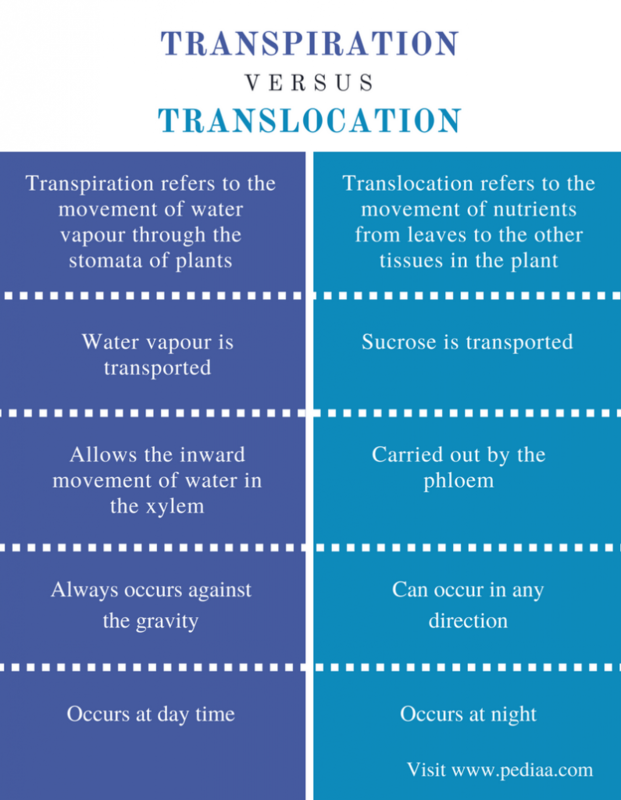 Transpiration and translocation are two processes that occur in plants. Both processes are involved in the movement of substances in the plant body. Transpiration refers to the movement of water vapor from the leaves to the atmosphere through the stoma whereas translocation refers to the movement of nutrients produced by the leaves throughout the plant body. The environmental factors such as heat and wind are involved in facilitating the transpiration. Transpiration allows the upward movement of water in the xylem. Translocation is carried out by the phloem. 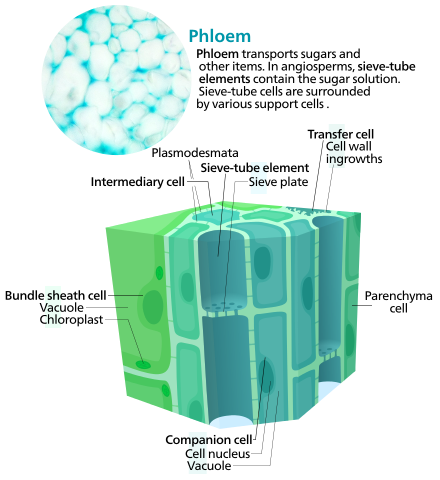 The phloem carries nutrients in the form of sucrose to the growing parts of the plant as well as the storage parts. Transpiration refers to the movement of water vapor through the stoma to the atmosphere. It is considered as the essential evaporation of water through the leaves. The 10% of the atmospheric moisture is contributed by the transpiration whereas the rest of it is from the evaporation. Guttation is a similar process to transpiration in which some plants exudate the drops of xylem sap on the edges of the leaves. Plants absorb water in the soil through their roots and transport it upward through the stems by the xylem. This water comes to the leaves and is mainly involved in the photosynthesis. The rest of the water is evaporated out from the leaves through the stoma. Transpiration can also occur through the stoma in the stems. Translocation refers to the movement of nutrients from leaves to the other parts of the plant body. Plants produce its organic substances inside the leaves in a process called photosynthesis. Glucose is the small sugar produced by the photosynthesis. Glucose is converted to sucrose in the leaves for the temporary storage. Typically at night, the sucrose is uploaded to the phloem. The phloem transports sucrose throughout the plant body. Sucrose and other organic substances transported by the phloem are called assimilates. Assimilates are loaded to the phloem at the source. Assimilates are released from the phloem at the sink. The transportation of assimilates occurs by the sieve elements of the phloem. The sieve elements join to each other at their ends, forming a continuous column. The transportation of assimilates by the phloem occurs through a concentration gradient. At the source, assimilates are actively loaded to the sieve elements. This decreases the water potential of the sieve element at the source. Water enters the sieve cells from the xylem, increasing the pressure inside the sieve element and pulling the contents through the column. At the sink, the removal of assimilates reduces the pressure of the column. The pressure difference between the source and sink serves as the driving force of the passage of assimilates. The structure of the phloem is shown in figure 2. Transpiration and translocation are two processes that occur in plants. 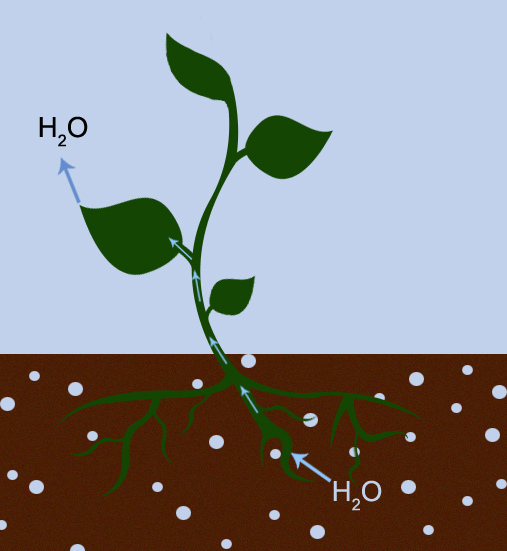 Both transpiration and translocation are involved in the movement of substances. Vascular tissue of the plant is involved in both transpiration and translocation. Transpiration: Transpiration refers to the movement of water vapour through the stoma of plants. Translocation: Translocation refers to the movement of nutrients from leaves to the other tissues in the plant. Transpiration: Water vapour is transported in transpiration. Translocation: Sucrose is mainly transported in the translocation. Transpiration: Transpiration allows the inward movement of water in the xylem. Translocation: Translocation is carried out by the phloem. Transpiration: Transpiration always occurs against the gravity. Translocation: Translocation can occur in any direction. Transpiration: Transpiration occurs at day time. Translocation: Translocation occurs at night. Transpiration and translocation are two processes involved in the movement of substances in the plant body. Transpiration is the movement of water vapor through the stoma. Plants absorb water from the soil and transport to the leaves. Water is required for the photosynthesis. Translocation is the transport of organic substances from leaves to the rest of the plant tissues. The main difference between transpiration and translocation is the mechanism and the type of vascular tissue involved in each process. 1. “Transpiration – The Water Cycle.” USGS Water Resources of the United States, Available here. Accessed 23 Aug. 2017. 2. “Translocation in plants.” LinkedIn SlideShare, 8 Jan. 2014, Available here. Accessed 23 Aug. 2017.